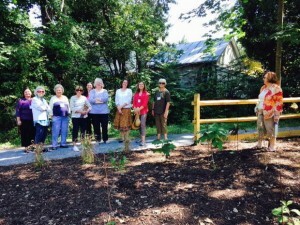 In the fall of 2015, the Carlisle Garden Club and the LeTort Regional Authority created a native garden at the LeTort Park. The garden is located near the bridge at the beginning of the LeTort trail. The garden was planted to fix a patch of eroding grass; therefore, protecting the local waterways. The native garden was designed by Deborah Bolger, a Carlisle Garden Club member and student of the Harrisburg Area Community College’s ornamental horticulture program. She hopes that as the garden blooms, there will be less of a need for weeding and gardening. Since the creation of the garden, signage has been added to identify the plants. The Carlisle Garden Club has volunteered over 100 hours of work for the creation of this garden. With the help of the Carlisle Parks and Recreation staff, the area was cleared and the soil was tilled. The garden was made possible through many grants and donations. The South Mountain Partnership provided a $7,245 grant to transform the space. This organization works to conserve the nature around South Mountain in central Pennsylvania. Additionally, Bolger donated the $1,000 scholarship that she received from the Carlisle Garden Club, a scholarship that was given to her to attend Harrisburg Area Community College. The LeTort native garden now provides a picturesque area for the community to enjoy and a solution to the erosion problem in the park. This project will protect the LeTort Spring Run and provide a native habitat for wildlife.